1. Professor (Maruthuvam) - 1) Post Graduate Degree in Siddha in the concerned subject recognized under IMCC Act, 1970 2) 5 years of teaching experience as Reader / Associate Professor in the concerned subject or 5 years research experience in PB-III (Rs.15,600-39,100) with GP Rs.7,600/- with NPA OR 15 years combined experience in teaching as Reader / Associate Professor / Assistant Professor / Lecturer in the concerned subject or 15 years Research Experience in the pay scale of PB- III (Rs.15,600 – 39,100) with GP of Rs.7,600/- , Rs.6,600/- and Rs.5,400/- with NPA respectively out of which minimum 2 years in the pay scale of PB-III (Rs.15,600-39,100) with GP Rs.7,600/- with NPA. 3) Minimum five research publications indexed in index medicus or National Journals. 2. Professor (Nanju Maruthuvam) - 1) Post Graduate Degree in Siddha in the concerned subject recognized under IMCC Act, 1970 2) 5 years of teaching experience as Reader / Associate Professor in the concerned subject or 5 years research experience in PB-III (Rs.15,600-39,100) with GP Rs.7,600/- with NPA OR 15 years combined experience in teaching as Reader / Associate Professor / Assistant Professor / Lecturer in the concerned subject or 15 years Research Experience in the pay scale of PB- III (Rs.15,600 – 39,100) with GP of Rs.7,600/- , Rs.6,600/- and Rs.5,400/- with NPA respectively out of which minimum 2 years in the pay scale of PB-III (Rs.15,600-39,100) with GP Rs.7,600/- with NPA. 3) Minimum five research publications indexed in index medicus or National Journals. 3. Associate Professor (Maruthuvam) - 1) Post Graduate Degree in Siddha in the concerned subject recognized under IMCC Act, 1970. 2) Five years teaching experience in the concerned subject or 5 years Research Experience in PB-III (Rs.15,600 – 39,100) with GP Rs.6,600/- with NPA. OR 10 years of combined experience in teaching as Assistant Professor / Lecturer in the concerned subject or 10 years Research Experience in PB-III (Rs.15,600 – 39,100) with GP Rs.6,600/- and GP of Rs.5,400/- respectively with NPA. 3) Minimum three research publications indexed in index medicus or National Journals. 4. Associate Professor (Nanju Maruthuvam) - 1) Post Graduate Degree in Siddha in the concerned subject recognized under IMCC Act, 1970. 2) Five years teaching experience in the concerned subject or 5 years Research Experience in PB-III (Rs.15,600 – 39,100) with GP Rs.6,600/- with NPA. OR 10 years of combined experience in teaching as Assistant Professor / Lecturer in the concerned subject or 10 years Research Experience in PB-III (Rs.15,600 – 39,100) with GP Rs.6,600/- and GP of Rs.5,400/- respectively with NPA. 3) Minimum three research publications indexed in index medicus or National Journals. 5. Associate Professor (Gunapadam) - 1) Post Graduate Degree in Siddha in the concerned subject recognized under IMCC Act, 1970. 2) Five years teaching experience in the concerned subject or 5 years Research Experience in PB-III (Rs.15,600 – 39,100) with GP Rs.6,600/- with NPA. OR 10 years of combined experience in teaching as Assistant Professor / Lecturer in the concerned subject or 10 years Research Experience in PB-III (Rs.15,600 – 39,100) with GP Rs.6,600/- and GP of Rs.5,400/- respectively with NPA. 3) Minimum three research publications indexed in index medicus or National Journals. The cost of application is Rs.500/- each for teaching post. 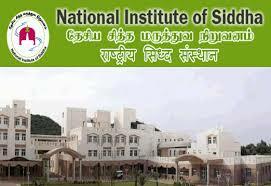 Application format is to be downloaded from our website, www.nischennai.org and the filled in application along with the application fee of Rs.500/- by way of demand draft drawn in favour of “Director, National Institute of Siddha” Payable at Chennai has to be submitted to the Director, National Institute of Siddha, Tambaram Sanatorium, Chennai:600 047 within 40 days from the date of Notification in the Employment News.SC/ ST candidates are exempted from application fee and they should produce an attested copy of the community certificate from the competent authority along with the application form to claim for application fee exemption.